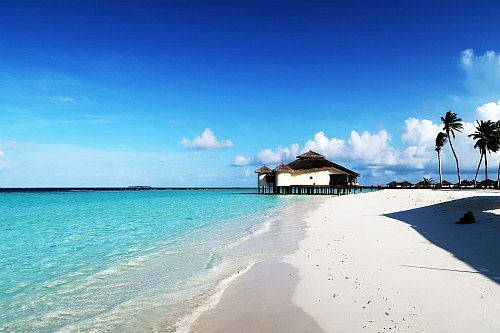 China Eastern has dropped the price of one of their May flights from Vancouver to Male, the capital of the Maldives down to $684 CAD roundtrip including taxes. This is 30% cheaper than the typical best roundtrip prices from Vancouver to the Maldives. 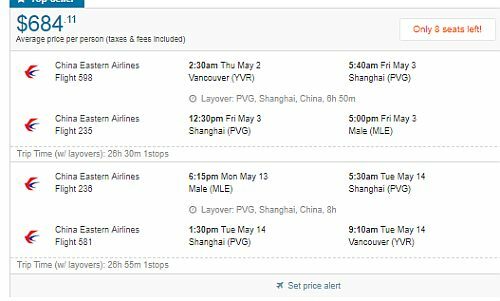 The flights have 1 stop each way in Shanghai, China. The layovers are pretty long (7 to 8 hours). Although the overall travel time (26.5 hours) isn't too terrible compared to the fastest flights possible from Vancouver to the Maldives (around 22 hours, using Cathay Pacific). NOTE: When your search is complete on Flighthub, the first result may show just 1 seat available. The second result shows multiple seats available.